Chippi Appam: Chippi appam is an appetizer made with curried rice flour and oysters. This is a favorite among the Muslim population in the Kanyakumari District in Tamil Nadu, India. 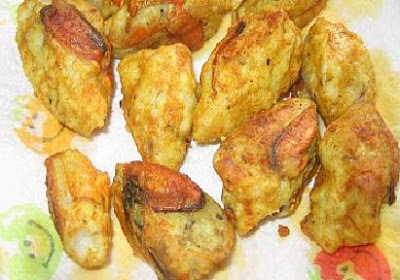 Chippi appam is a very popular appetizer in Malabar cuisine. Crush small onions, chilli powder, turmeric powder and fennel powder and grind them up to a fine paste, to make a masala mixture. Mix the grated coconut with roasted flour and masala mixture. Knead well, as to avoid any lumps. The consistency of the dough is a little more solid than the chapatti dough. This dough forms the filling. Clean the mussels well, by scrapping off unwanted matter that sticks on to the shells. Remove the mussel beard from the mussels. Split the mussels and stuff it with the dough filling. Steam the dough filled mussels for 10 minutes. Chippi appam is ready to be served. Serve slightly warm chippi appam with a sauce of your choice. If you have any queries regarding the Chippi Appam recipe, please leave a comment.